Wednesday afternoon saw me sitting on a rock beside a river for five minutes when I really should have been racing on to the next thing. Sitting there, looking down into the coppery water, I was reminded of something from my childhood, something I hadn’t thought of in years. When we were kids, in the early seventies, Polaroid sunglasses suddenly became a huge object of desire. A quick internet search shows that they had been around for a darn sight longer than that but, for whatever reason, an advert campaign or something, they suddenly became hot to us at that time. 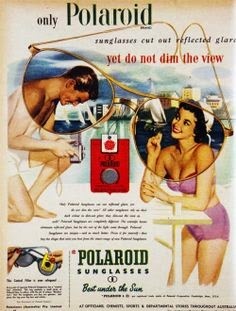 It must definitely have been an advert campaign that set us off on our Polaroid fixation because it wasn’t the looks or the image of the product that grabbed us. Oh no. It was one thing and one thing only… the glare reduction. We lived beside the river, you see, and our summer’s were largely spent wading about in the river, looking for stuff. Eels under rocks, lost lures snagged in weeds, pirates’ treasure. You name it, we were looking for it down there in the brown coppery water. And we were invariably hampered in our search by the glare on the surface. We couldn’t see through it. We had to feel around blindly beneath the awful shine and hope for the best. Then, suddenly, there was Polaroid sunglasses and their amazing, truly amazing, ability to cut out the glare on the surface of the river and allow you to see beneath. They were right there too, in the local chemist’s shop, on a rotating rack. Too expensive to be owned. We used to offer to pick up prescriptions and such just so that we could stare at them and, if the shop was quiet, perhaps risk trying a pair on. Trying them on wasn’t much use, really though, because there’s wasn’t any watery glare in the shop to try them out on. Eventually, somebody got a pair. It was one of the older boys, I can’t remember who. The clamour by all the other kids to try his Polaroids out on the river was terrifying but we all got a go. Did they work? Well, yes, they did. Perhaps not as earth-shatteringly well as they did on the telly but still the bottom of the river could be seen and that, for us, was all that mattered in the world at that time. That’s what I thought about when I sat down at the river on Wednesday. Polaroids. It was a good little memory that I wouldn’t have got if I hadn’t taken the few minutes to pull over and look into the water. It had been a stressful day and I was all about racing past the river spot and getting to where I was supposed to be but the sun was shining, I could afford a few minutes, a something said ‘stop’. A friend of mine is looking into Mindfulness at the moment. I don’t know anything about it, really, only hearsay and Chinese whispers. If pushed, I would say it’s about being in the moment you are in, without apology and without projecting forward to where you are going or backward to where you have been. I said I would take this riverside pause to be as ‘in the moment’ as I possibly could be. I took a self-conscious breath and looked around, as hard as I could, at where I was. There was the river, of course, fast flowing and remarkably brown, as if it had come from some iron-rich land. There were reeds, on the further bank, and the place were they entered the water created a little rivulet in the surface which expanded and recreated like a tiny pebble thrown in. There was a bird then, a tiny guy with a red hood over his head. He was busy, darting here and there in a very small region within a clump of bushes. Under the water there was clumps of grass where part of the river bank must have fallen in. The grass down there still seemed to be growing, despite the alien conditions it found itself in. Lastly, in a long list of inconsequential things, there was a telltale plop in the centre of the river as a small fish came up and sucked down a surface-ridden bug. It came up again and again and I watched to see if I could see the actual fish as opposed to the spoor of his movement on the surface. Alas I never did. If only I had those Polaroids then. It was a good exercise, that five minutes out of time. For at least three minutes of it, there was no thoughts of ‘what happens’ next’ or ‘what just happened’. There was only the place and the quiet little things that were going on there. It’s not something I would tend to do much and, here, I have to confess one element which seemed to enable me to do it was this: my phone had died. The battery had run out, a thing that I never allow to happen. Deprived of the potential for contact from the world at large, I think I felt more licensed to take a Ferris Bueller moment and just look around a bit. I’m glad I did. I must do it again sometime soon. And I must remember to bring some Polaroids. I will probably have been about thirty when I got my first sunglasses. I’d tried sunglasses on before that but as I had to take my normal glasses off to do so I couldn’t see anything so what was the point except to look cool? The opticians I went to had an offer on—I know, they always have offers on these days—but it was still a bit usual then: a second pair free, including sunglasses. So I went with the sunglasses with the polarised lenses and I remember walking out of the shop with my new specs on and looking up at the sky and oh my. Loved those glasses. Wore them everywhere. Still have them but my eyes have deteriorated and they’re not much use. I could get a fresh pair but I wear varifocals these days and the kind of offers they have usually don’t include fancy lenses. For a long time I did wear quite heavily tinted lenses which were almost as good. Especially when I got the wee round glasses. Didn’t make me look like John Lennon or anything but I loved those glasses too. I wonder how many pairs of glasses I’ve had in my lifetime. A couple of years back I took a carrier bag full down to Specsavers for them to recycle or whatever they do with them but not the wee round glasses or the sunglasses. Not quite ready to part with them. Like you I know nothing much about mindfulness although I know more now than I did ten minutes ago (thank you Wikipedia). Not sure as I’m capable of it. I would need to be able to relax and I’m not sure I’ve ever relaxed. I’ve rested but that’s not the same. Do you remember the Star Trek: The Next Generation episode ‘In Theory’ where Lt. Jenna D'Sora falls in love with Data? There’s a scene where she asks him to kiss her and then after asks, “What were you just thinking?” to which he replies, “In that particular moment, I was reconfiguring the warp field parameters, analysing the collected works of Charles Dickens, calculating the maximum pressure I could safely apply to your lips, considering a new food supplement for Spot.” That’s me to a tee.